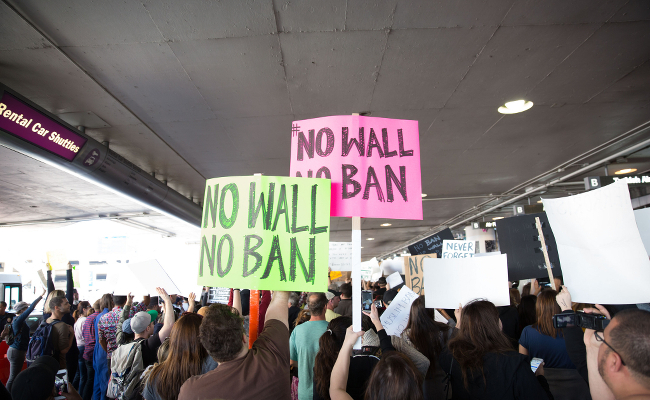 Donald Trump’s travel ban is in the news again, as the president has asked the Supreme Court to reinstate it, overruling lower courts that determined it was unconstitutional. The highly controversial executive order was one of the first he signed and it was almost immediately smacked down in court, with plaintiffs noting that Trump used discriminatory language during his campaign when he promoted putting a stop to Muslim immigration into the U.S. The ban, which targeted majority-Muslim countries in the name of public safety, arguing that the government needed time to develop “extreme vetting,” put the brakes on entry into the U.S. for people holding passports from seven countries for 120 days, and banned refugees for a more extended period. The president’s legal team tried to claim the ban applied to everyone from those nations equally, so it wasn’t unconstitutional, but courts weren’t sold — in part because of the president’s statements on Twitter. Staffers returned to the drawing board with a softened version of the ban, which dropped Iraq from the ban list and made some other key changes, but courts still weren’t having it. Now, Trump is turning to the court of last resort, and he may not have an easy time of it. While the court could opt to reverse the lower rulings now, it likely wouldn’t hold a full trial until the fall, so it needs to weigh the material it has available. And Trump’s comments on Twitter are creating an arsenal of material for groups like the ACLU, which crowed about that fact on the very same platform — when the President of the United States is issuing quasi-official statements on Twitter, those who interact with him must follow. Following the attacks in London, Trump pressed the case for a “travel ban,” and on Monday morning, he was back in form on Twitter, explicitly saying “I am calling it what we need and what it is, a TRAVEL BAN,” even as his staffers were trying to undo the damage in their own public statements. It would appear that the president is undermining both his own case and his spokespeople, all at the same time. The more he reiterates that it’s a targeted ban, the more he leaves the Supreme Court with no real choice but to uphold the lower court rulings. Here’s the really interesting thing: The Washington Post notes that the time periods defined in the original executive order have actually already lapsed, and the limits on the second order are rapidly approaching as well. The administration’s argument was that it needed to “pause” entry into the United States to develop tougher vetting for immigrants, so what has it been doing all this time? Why is the “pause” still necessary? In fact, the administration has been cracking down on immigration. Officials can now ask visitors to the U.S. for a variety of personal information on visa applications, including social media history, presumably with an eye to excluding people who might pose a security threat. The United States has also taken steps to screen refugees even more closely, something even Trump admits. Despite the lack of ban, it’s doing what it said was necessary to protect the nation — so why is Trump still pushing for it? In a way, the ability to continue cracking down on immigration sans ban is another strike against Trump, with even Republicans noting that plans to increase border security are moving forward without needing an executive order to pause immigration from some regions of the world. Trump’s persistence in pushing to reinstate the executive order suggests that the real problem here isn’t one of national security, but of wanting to keep Muslims out of the United States, something that is both unconstitutional and unAmerican. Incidentally, if you’re worried about national security? The number of terrorist attacks committed by people from nations named in the executive order is zero. Whilst I'm at it - Trump banned people from Muslim majority countries from entering the USA ostensibly because he wanted to protect the public from terrorists and didn't want them rampaging around the place with guns and killing people. But....isn't that what happens a lot in America anyways, and often because of upset and excluded feeling kids and guys with weird complexes who have very easy access to guns? And not to mention the trigger happy police you have over there. From what Care2 says, if you're Black or someone's pet dog, the police are going to shoot you for breathing too loudly. And you think banning Muslims is going to keep your kids safe? Why don't Americans just try not shooting each other for 10 minutes? Hi Deborah W, such disappointing and sad comments from you. Britain has not 'succumbed' to anything. The Mayor of London was voted in by the people of London. And we did this without any meddling from Russia. In our country, we call this democracy. Not sure if you've heard of that where you come from. Sorry if you don't like our London Mayor or any of our other Mayors but you're not from London or Britain, so who cares what you think? SOMETHING TO THINK ABOUT ...How the Brits have passively succumbed to the Muslin invasion (below) -- will we be next? Mayors of London, Birmingham, Leeds, Blackburn, Sheffield, Oxford, Luton, Oldham, Rockdale ... ALL MUSLINS. Over 3000 Muslim Mosques, over 130 Muslim Sharia Courts, over 50 Muslim Sharia Councils. Many no-go areas all across U.K. 78% of Muslim women don't work and are on FREE benefits/housing, 63% Muslim men don't work and are on FREE benefits/housing. Muslim families average 6 to 8 children, all planning t5o go on FREE benefits/housing. Now ALL U.K. schools serve ONLY Halal meat. ALL THESE THINGS ACHIEVED BY JUST 4 MILLION MUSLIMS OUT OF THE TOTAL 66 MILLION POPULATION. Are we next? Trump undermines his own case on everything he says and does. He doesn't seem to remember the lies he has told even though we've seen them all on video, and he has apparently never noticed we have a constitution. I heard today that the hold on the "travel ban" was upheld . GOOD !!! Most sociopaths are better liars than Trump. No one lies more, but he is such a blabbermouth and so inconsistent in what he says that judges and prosecutors just have to turn on TV to watch him incriminate himself by undoing his own last lie. The travel ban applies to failed states and not the largest Muslim-majority nations or the countries terrorists have come from in the past. Except for Iran a hostile country the ban applies to countries in the midst of civil war or those who have suffered a complete collapse of the government. Will the travel ban make us safer? No as anyone with evil intent will find a way around any action (if they don't already live here) especially one so publicly debated but it gives Trump a chance to show the base that he's "doing something." Compared to some of the other things we have done to combat terrorism such as invading Iraq and Afghanistan, launching perpetual warfare in the Middle-East, enacting the Unpatriotic Act I'm not terribly concerned about this travel ban. I used to give him more credit, but the president seems to be dashing a lot of perceptions that maybe he was not as bad as he seemed.